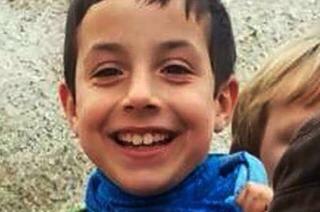 An eight-year-old boy, whose disappearance received nationwide attention in Spain, was strangled on the same day he went missing, local media quote an autopsy as saying. The body of a Gabriel Cruz was found in the boot of a car being driven by his father's partner on Sunday. Ana Julia Quezada, 43, has been arrested. She had regularly appeared at rallies to find the boy. Gabriel went missing in the southern province of Almeria on 27 February. On Monday, investigators took Ms Quezada to key locations in their inquiry. She is alleged to have hidden the boy's body at a family property in the village of Rodalquilar, but was caught by police trying to move it elsewhere. In video footage of her arrest, she is heard to shout: "It wasn't me! I collected the car this morning!" Meanwhile, police are reportedly reviewing the previous case of a child who died in her care. In 1996, a four-year-old girl fell out of the window in the northern city of Burgos, where she was with Ms Quezada, who is originally from the Dominican Republic. The death was ruled accidental at the time. Gabriel was last seen leaving his grandmother's house in the village of Las Hortichuelas, next to Rodalquilar, in the municipality of Níjar. He was supposed to go over to a neighbour's for a playdate, but he never returned. On 3 March, the boy's father Angel Cruz and Ms Quezada found a T-shirt with his DNA 10 km (6 miles) from Níjar. Spanish media report that the police have been monitoring Ms Quezada since then. She had been a fixture at rallies attended by thousands of supporters. An image of a blue fish - inspired by Gabriel's love of the sea - was shared on social media with the hashtag #TodosSomosGabriel, meaning "we are all Gabriel". On Monday, Gabriel's mother, Patricia Ramirez, appealed for calm in a radio interview. She said she had always suspected Ms Quezada was behind her son's disappearance, but that justice should be allowed to take its course, denouncing messages of hate directed at the suspect.